Beakerhead, an opportunity to break down the stereotypes of science, continues this week with more fantastic events to capture your interest. 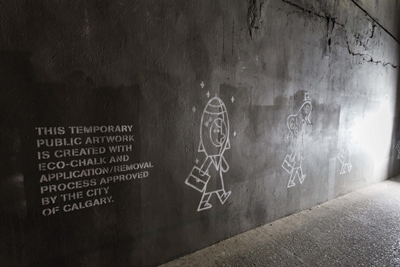 Science meets art, as Calgary welcomes back Beakerhead to the city with cool eco-friendly graffiti in busy underpasses downtown. This three-dimensional brain is sure to be a hit during this week’s events. Taking place on Sept. 13 and 14 at the Telus SPARK Dome Theatre this 90 minute “fantastic voyage” will take you on a musically driven tour of the brain. Dr. Christian Jacob University of Calgary professor has developed this unique multimedia project with the Hotchkiss Brain Institute at the University of Calgary. On Sept. 12, Art Cars will take over the downtown streets. At this free event you will see the world’s largest solar-powered tricycle and have the opportunity to create your own Art Car. This is your chance to create the creative car of your dreams! Sure to be a popular event among thrill seekers, the Catharsis Catapult Competition will be taking place on Sunday Sept. 14 at Canada Olympic Park. The competition will have several teams building catapults to launch items that “you love to hate” – whatever that means to you. We’re thinking old textbooks, ugly Christmas sweaters and that Hanson Christmas CD you have been holding on to. A beer garden and food will be on site. This will be the Canadian debut of fire-breathing octopus, El Pulpo Mecanico. The octopus will put on a full extended performance nightly Sept. 10-12 from 7p.m.-11p.m. through the streets of Inglewood. This interactive sculpture was made primarily out of recycled junk found in a scrap yard. To catch the show visit the Crown Surplus at 1005 11St S.E. This Beakerhead must-see will combine beauty and science, providing a night of DIY beauty. Marie Rayma of DIY blog Humblebee & Me wants you to start thinking about what you are putting on your face every day. She will be giving you the opportunity to learn what’s really in your make up from chemist Adrienne Lee. The event will be hosted at John Fluevog shoes in Fashion Central on Thursday, Sept. 11. The motherload of all science parties, Beakernight will be taking place on Sept. 13 showcasing everything science, fashion and art. If you can make it out, you will have the opportunity to see Laser Cat from Barcelona, an incredible fashion show by Make Fashion and a drive-in video game. This is the perfect night to wrap up the two weeks of science and arts mash-up events. If these events are for you, visit beakerhead.org for more information.